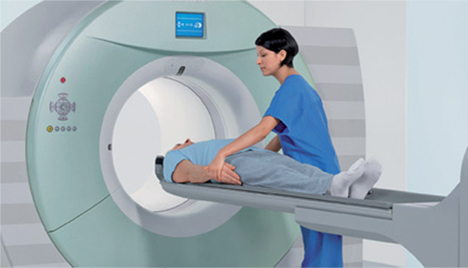 Positron emission tomography (PET), also called PET imaging or a PET scan, is a type of nuclear medical imaging that produce 3 dimension images of biological functions. PET scans can not only diagnose health conditions, but are helpful in determining how a condition is developing. Nuclear medicine imaging procedures are primarily noninvasive and usually painless medical tests that use radioactive materials called radiotracers. Radiotracers are designed to bond with certain chemicals within the body, like glucose, and highlight areas that are using those chemicals. PET scans are often combined with X-rays, MRIs or CT scans to produce a more complete picture that can pinpoint disease centers in the body. Combining multiple types of imaging gives physicians more precise information and leads to more accurate diagnoses of cancer, heart disease and brain disorders. – The patient should abstain from wearing powder, lotion and/or glitter in the chest area. – The patient should refrain from taking aspirin or any anti-clotting/blood thinner medication for at least seven days prior to their appointment. – It is highly suggested that the patient sends to our office all prior breast examinations including but not limited to breast MRIs, mammograms and ultrasounds, if any. – Patients should not eat or drink for at least six hours before the scan. – Patients should not exercise the day of the scan. – Patients should bring a copy of their most recent CT scan, X-ray or MRI films to their appointment, if any. – The patient should refrain from wearing clothing with metallic jewelry or ornaments such as hair clips, under wire bras, zippers and buttons.